I made this last week for a Cinco de Mayo dinner. It was easy to do. Everyone was so surprised and impressed. I did stray and use a different flavor of frozen yogurt, as I knew my guests would prefer it over vanilla. Cinnamon Toast Crunch works really well for this recipe! I’ve made it several times and it tastes just like the real thing. This is perfect, thanks for inspiration!!!! My husband doesn't really like sweets, and I was looking for some kind of treat to make with his birthday dinner. Once we got past the point of my kids asking if I was serious that they fry ice cream, all of us gave it a big thumbs up. Gina, I do not buy cookbooks because I think they are mostly clutter, but I am definitely buying your cookbook! I can't miss when I make any recipe from your blog! 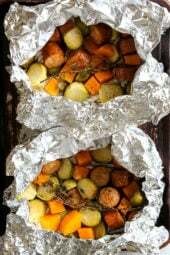 Do you have the recipe that your fan made with everything in a pan? I am looking to make this for 15-20 people so I thought the pan would be easier. Do I just layer everything on top of the ice cream? We use Honey Bunches of Oats with Almonds. But before I crush it up I drizzle honey on the cereal and toast it in the oven for a bit. When it cools I crush it up and roll the ice cream in it. My kids LOVE making these! I made these tonight and they were delicious! The crunchiness of the cereal really gave it that fried texture I was craving. I will definitely be making these again. It's so great that it satisfies my sweet tooth without he added calories from frying. Thank you again for another great recipe. This was AMAZING! Definitely best drizzled with honey…tastes just like the deep-fried-ice-cream @ my local Mexican restaurant (that probably has 1000 calories!). Thank you Thank you! OMG….this just finished this and it was delicious! I too used the cinnamon pecan Special K and it was wonderful! Can't wait to share this with friends….what a treat! Thank you Gina for all your hard work and these wonderful recipes! 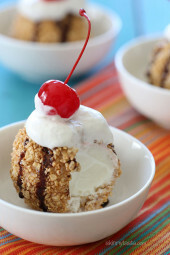 This is a tasty recipe but now I have heard about "fried ice cream" i can accept no substitute. 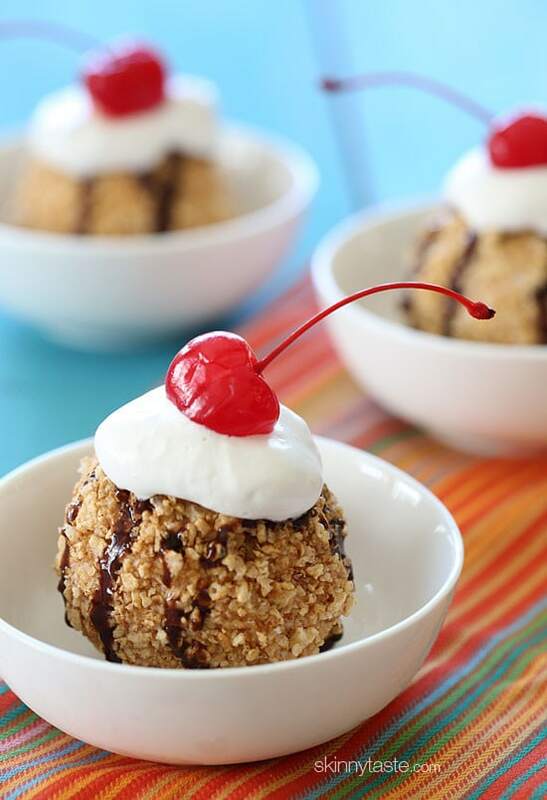 b) put up a recipe with techniques to make fried ice cream. In Australia we get fried ice-cream at Chinese restaurants – they're usually the one and only dessert on the menu! 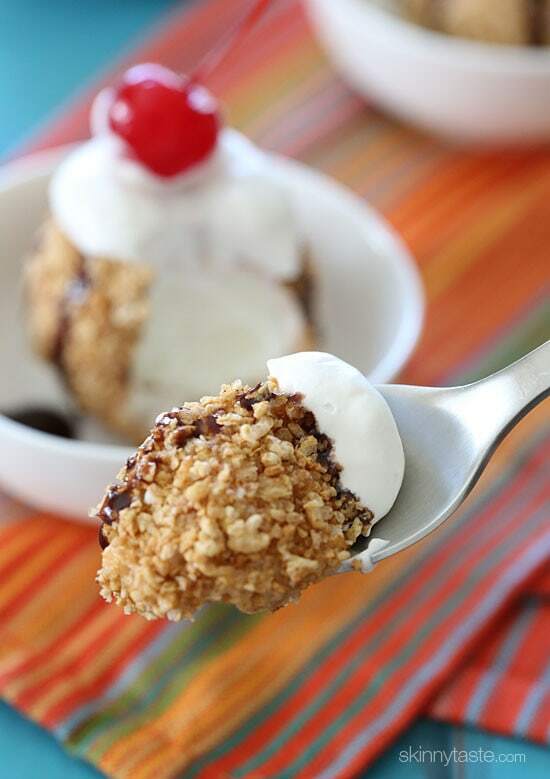 In New Zealand,it's the same as Australia – deep fried ice cream only found in chinese restaurants. They don't actually deep fry it, held in a ladle with hot oil poured over til coating is crisp. I never thought I would eat fried ice cream again! On Cinco de Mayo we made your Salsa Verde Chicken in a taco shell (i cannot find the tostadas but I want them!) followed by this and we felt like we were at an authentic Mexican restaurant! It was sooooo good! 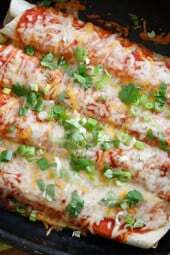 I made these for my Cinco de Mayo dinner, they were a HIT!!! Gina! I LOVE FRIED ICE CREAM!! Do you think it will taste just as good with fiber one honey cluster cereal? Silly question here, but did you freeze the yogurt yourself or buy it already frozen? They look amazing and I can't wait to try them! She used frozen yogurt. It comes frozen just like ice cream. You find it in the ice cream section. 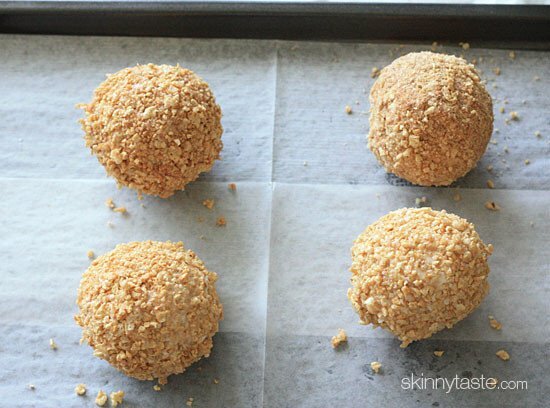 It's really good made with graham cracker crumbs, too… not sure that that would make this a healthy recipe anymore, but it tastes just like the real thing! I prefer honey to the chocolate syrup… that's always what I got at Chi-Chi's…. miss that restaurant SO much! I made these today snd they were really good! I used the chocolate fiber one cereal sd I fidnt have Special K and they were really good..thanks Gina!! 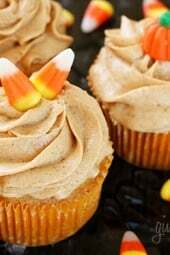 These look amazing, thank you for so many creative recipes Gina! WIth your help, weight watchers is easy and fun! I have to tell you that Oikos is actually made by Dannon, not Stonyfield, but both make delicious yogurt. Having worked for Dannon previously, I find that a lot of people don't know that they make Oikos. This is amazing. I could not believe how much it tastes like fried cream! I did use Edys 1/2 fat vanilla bean ice cream instead of frozen yogurt. I also used Special K with pecans and cinnamon. Will keep these in my freezer often. My family loved it. 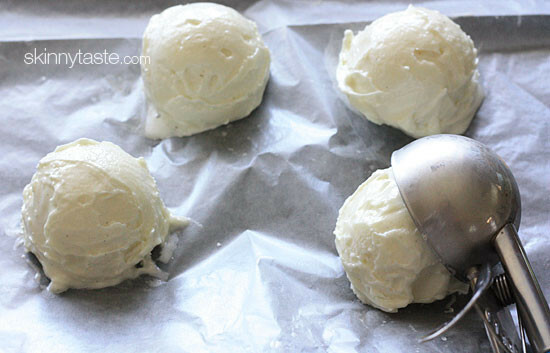 I just made this… super easy and super yummy. I agree with the commenter above that a little drizzle of honey gives it a lot! LOVE LOVE LOVE this… Happy Cinco de Mayo! It really needs to stay frozen like any ice cream would, maybe in a cooler packed with ice? I always thought the fried ice cream sort of tasted like it was rolled in rice krispies. Think I'll try that-wonderful idea and what a nice presentation it makes. Yum, can't wait to try this one!!! I just rediscovered fried ice cream at a little Mexican place and forgot how good it was. Thanks for this skinny version! 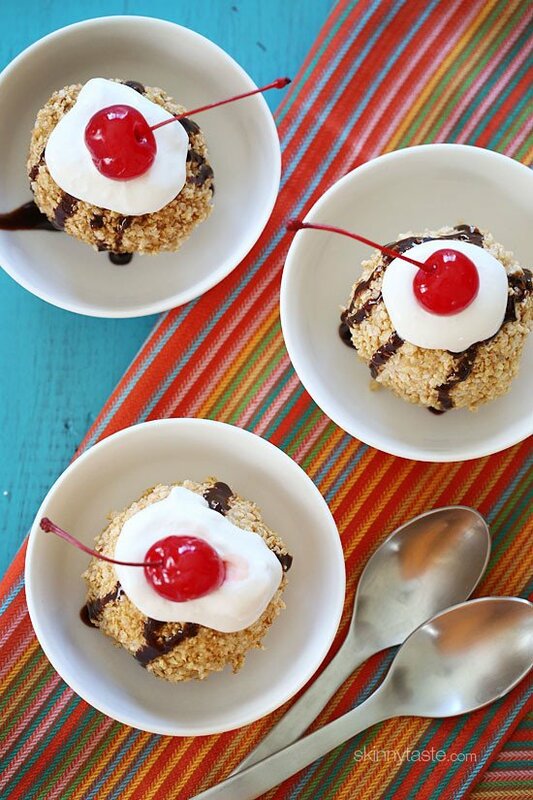 I used to order fried ice cream for dinner at every single Mexican restaurant as a teenager. Now that I eat healthier, I need to try a healthy version! Great recipe. 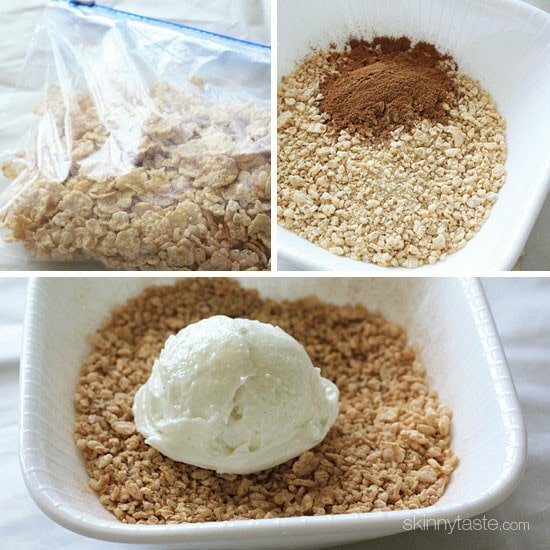 I think ill try a coconut ice cream with a grain- free granola topping! Yum! ;) Thanks for the inspiration!!! Great idea Gina!! Today is an ice cream kind of day!! This is such a brilliant idea! We took a friend to Chevy's for her birthday one year, and they brought out a sombrero and fried ice cream for her. We were all surprised that the ice cream didn't melt in the frier too! But I didn't like how greasy it felt, so I'd probably like your un-fried version a lot more! OMG!! I just love you and your recipes :)!!! This made my day Ms Gina!! Totally going to try that! Sounds and looks amazing. Can anyone recommend a good gluten free cereal substitution ? We are new to the gf lifestyle and I'm still tryin to figure it all out! I'd try a brown rice crispy cereal. Mesa Sunrise might be good as well. Their maple flavor is one of my favorite splurges. I'm not sure any GF cereal would hold up for long in the freezer though. I'd roll and serve right away. Chex makes lots of different gf flavors including cinnamon. Just when I started my Paleo diet….:(! omg i want this now! Bless your heart for making this!!! I had fried ice cream for the first time a few years ago and was immediately obsessed. One of the best desserts, hands down! I've made this with fiber cereal brand "cinnamon toast crunch" and it was heat so ill have to try this one too!!! Oh my gosh, I could kiss you. This is amazing! I can't wait to try it!! I would also add a bit of honey on top too! 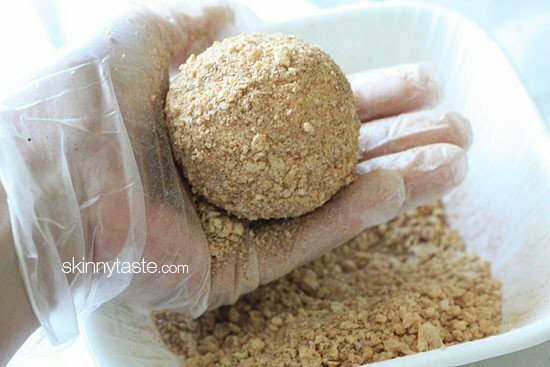 The cinnamon/honey combo MAKES fried ice cream! What a great alternative!!! Looks beautiful! Turkey Hill also has a very good frozen yogurt line, but I don't know if their distribution radius extends into NY. I can only buy it in one store in my area, so I always load up when I go in. The cashiers probably think I'm nuts. I've seen their tea in Kroger's in Texas and I know you can buy ice cream and tea at Giant in Virginia. Good to know, is it fat free? Love this! Going to make asap!